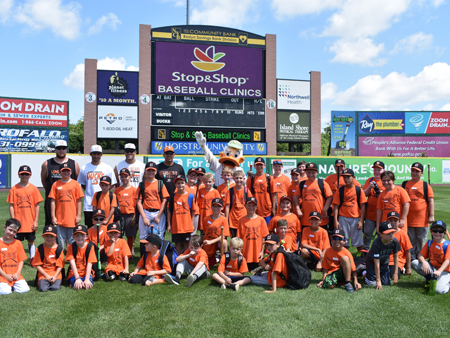 Put your future All-Star on the fast track to the big leagues at the Long Island Ducks Kids Clinics, presented by Stop & Shop! Players of all abilities between the ages of seven and 14 are welcome, and interested parties are encouraged to sign up early due to limited availability. CLICK HERE to sign up for the 2019 clinics! 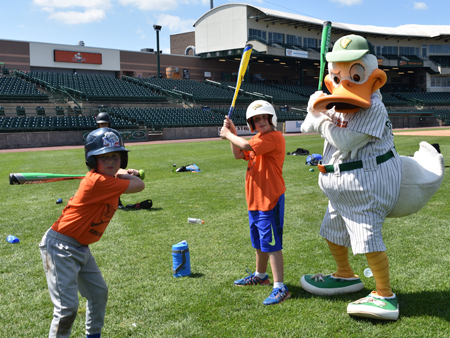 Each session is led by Ducks Manager and 1986 World Series champion Wally Backman, and features instruction from Long Island Ducks players and coaching staff. All three days of the clinic take place from 9:00 a.m. to 12:30 p.m., and children should arrive no later than 8:45. Those who sign up for both clinic sessions will receive an exclusive bonus gift of a free Ducks Kids Club membership, a $25 value! Kids need only bring a glove, a bat and be ready to play, rain or shine! "Let me take this opportunity to thank the entire Ducks organization for a great camp and an awesome experience for my son, Angelo. He was able to take away some very good tips for pitching and infield defense. He also enjoyed working in the indoor cage and has become a big Matt Padgett fan since then. Angelo is already talking about coming up next year for camp so you will see us again. Thanks again for providing my son with a great experience!!" "My children love the player interaction, the instruction they receive from the actual players they watch at games and the whole 'down to earth attitude' of those involved with the clinics. My younger son, Christian is a true sports lover, so to have one of your team members teach him a batting stance or the correct way to throw pitches is an exciting thing for an eight-year-old boy. Our older son, Michael, has improved his skills as well and enjoys the player interaction too. All in all, I'd like to thank you for having such affordable, convenient family oriented things at your ballpark for the people to enjoy." "I just want to say thank you to you and all the Ducks for putting on such a wonderful and informative baseball clinic. My son Spencer has done this camp twice already and has loved it more and more each time he did it. The Ducks players and QuackerJack are AWESOME with the kids. They really take time to teach them all the fundamentals of the game, and for that, we are truly grateful. My son Spencer had a wonderful time, and he will see you next year." "Thanks for the great weekend for my grandson, Joey Giasi. I had heard about the clinic from a friend at work and thought it would be the perfect birthday present. He just loved working with the players who were so great with the kids and just being on the field in such a beautiful ballpark impressed him. He just couldn't stop talking about all the training tips he learned. He wants the same gift next year. Thanks to you all. Great job!!!"